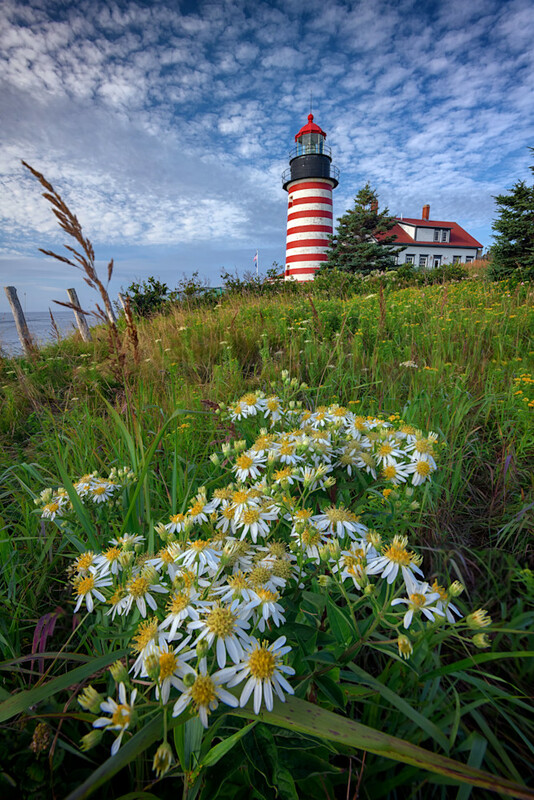 Tall white asters grow in a field near West Quoddy Head Lighthouse in Lubec, Maine. Tall white asters, a floral plant native to New England and Canada, bloom in a field near West Quoddy Head Lighthouse in Lubec, Maine. The current lighthouse was completed in 1858. West Quoddy Head is the easternmost point in the United States. This was taken during my second visit to Lubec. I'd been photographing in Quoddy Head State Park, and as I returned to my car I decided to make a few images of the lighthouse from a rocky outcropping. After I finished, I was heading back to my car and noticed these flowers and decided I wanted to make an image that emphasized them next to the lighthouse, which has long been one of my favorites.